When Mike began coaching Junior Football League games in 1972, money was tight. "We had our meetings on Adams Street, and they'd have to walk across the street to South Side Bank to sign a note to fund the season," Burns said. The 55-year-old Washington native retired earlier this month as president of the JFL of Central Illinois. 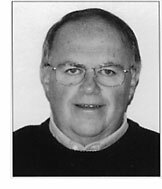 During his 15 years in that volunteer position, Burns added flag football and cheerleading, developed seven new JFL areas and increased total participation by I,500 for today's total of about 4,000.
the formerly cash-strapped organization had about $280,000 in the bank and an annual operating budget of nearly $500,000 by the time Burns retired. "We had a bad reputation with a lot of high school coaches and officials, for good reason," Burns said. "We had some coaches out there who had no clue about youth sports. They were out there reliving their high school days. Now, high school coaches all welcome the JFL. We cleaned up a lot of things." Burns is retired after working 30 years as a Caterpillar, Inc. assembly worker. Although he had no college degree or background in the field, Burns became adept enough to start his own fundraising business. He is now retired from that job as well, in order to spend time with wife Crystal, daughters Kelley and Missi, stepsons Sean and Troy and three grandchildren. But Burns still plans to help the JFL, remain president of the Old Timers Association - which raises $15,000 to $17,000 annually for youth sports and charities - and help a host of other causes. "Anything I'm involved with, he's my first choice to add to the committee," said Old Timers treasurer Quent Yerby, the 1978 Neve Harms winner. "Everything Mike has ever done, he's never gotten paid. He won't accept anything - maybe a free lunch." 2) They have played in the title game of the state Class AA softball tournament in two of the last three seasons and have made the final four the last three springs. Which is why the 12-year Morton coach has been named the Tri-County Female Coach of the Year for the second straight year. 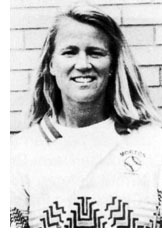 In 1995 Morton finished third in the state, won 35 of 39 games and MacIntosh bagged her first Tri-County award. This past June, Morton fought Moline into the 10th inning of the title game in Pekin before bowing 3-2, again finishing 35-4. Morton has gone 106-12 the last three seasons under Macintosh's coaching, raising her career mark at Morton to 274-119. A graduate of Mt. Zion High School, Macintosh played softball, field hockey, and swam at Eastern Illinois University. She then coached one season at Wilmington High School and two years at Mt. Zion before moving on to Morton where she has made Morton a dominant power in the strong Mid-Illini conference.